The earliest Mayan artists were primarily focused on religious themes. At this time, the Mayans depicted such activities as human sacrifice, warfare, daily life, and religious rituals with startling realism. All of the great Mayan cities created great sculptures. Sculpturing embellished Mayan temples, stela(e), monuments, and buildings. Sculptors produced amazing images of mythological creatures, decreased rulers, deities, and supernatural animals. Lords and rulers were attired in elaborate headdresses, costumes, and jewelry. 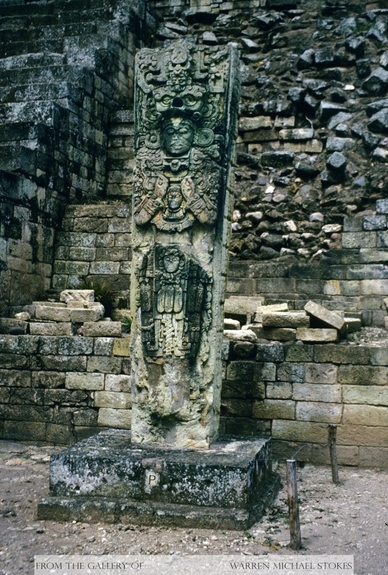 Mayan sculptors preferred to work with limestone. However, they also worked with trachyte, sandstone, wood, and clay. They did this with nothing more than stone tools and wooden mallets. Ceramics were equally important to the Maya. They used a crude device that rotated between the potters feet called a kabal. One of the first ceramic styles was called Amyan. Amyan style ceramics were believed to have been developed in the Guatemalan highlands around 1,000 BC. These first designs were very simple and one color. They made whistles the shape of animals as well as cooking pots and drinking vessels. Then between 300 and 700AD the Mayans excelled in ceramic development during what is now called the Early and Late Classic periods. These ceramic styles were called Tzakol and Tepeu. They are characterized by a variety of jar, bowl, plate, and vase styles. During this period the Mayans mastered a variety of decorative techniques including polychrome painting. The Tzakol and Tepeu ceramics are considered to be the most beautiful pottery made in ancient Mesoamerica. They were primarily decorated in animal deities, grotesque monsters, nobles and priests, and scenes of human sacrifice, in the colors of orange, yellow, and red. The narrative quality of Mayan ceramics carried over into the murals that once covered the interior walls of Mayan palaces and temples. Murals have been found in a multitude of locations. The most dramatic of these are the fabulous frescoes at Bonampak in Chiapas, Mexico. Murals treated a wide array of subjects in very realistic terms. From this great detail archaeologists have been able to learn a great deal about costumes, musical instruments, religious rituals, warfare, and methods of human sacrifice. Mayans also excelled in the working with jade. Jade was highly prized in Mayan world. The excavation of tombs has yielded large amounts of jade jewelry, effigies, plaques, and mosaics. Mayan craftsmen also carved in bone, shell, and wood. We have little information about the Mayan perishable arts of feather work and weaving because little has survived. Metal work did not become important until the Post classic period after 900 AD. From the evidence that we have we know that the Mayans mostly worked in copper and gold. Some gold bowls, cups, rings, and effigies have been found at excavation sites. However, most of the artifacts found have been made out of copper. These include bells, tweezers, axes, earplugs, rings, disks, and small masks. Today, there exists a large quantity of Mayan art in museums throughout the world, but this does not stop archaeologists from searching for new sites, hidden hieroglyphic codices, buried statues and tombs, or some lost long lost mural deep in the darkest jungles. More and more is being excavated all of the time. What is truly amazing is how much more remains. For example, Mayapan, the one time Mayan capital, sits on the Yucatan Peninsula in a state of decay. Its splendors are in ruins, with no date scheduled for excavation or restoration.